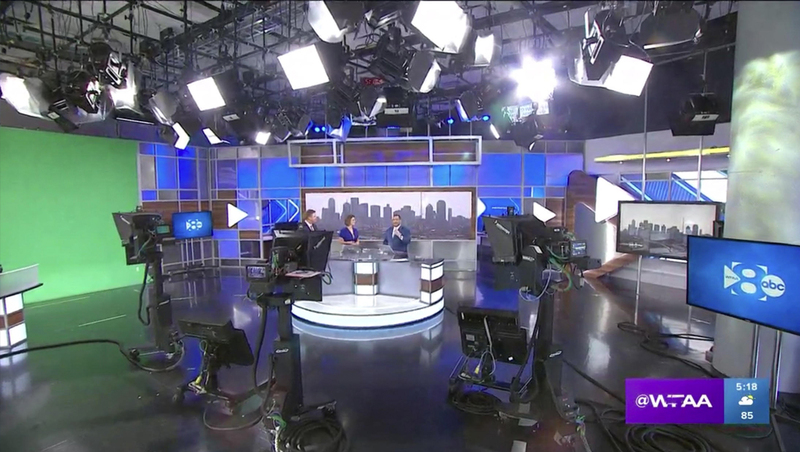 Dallas‘ WFAA has unveiled a revamped version of its Victory Park Studios that incorporates the new Tegna “in the round” anchor desk along with elements from the old studio and a triangular “play” icon. 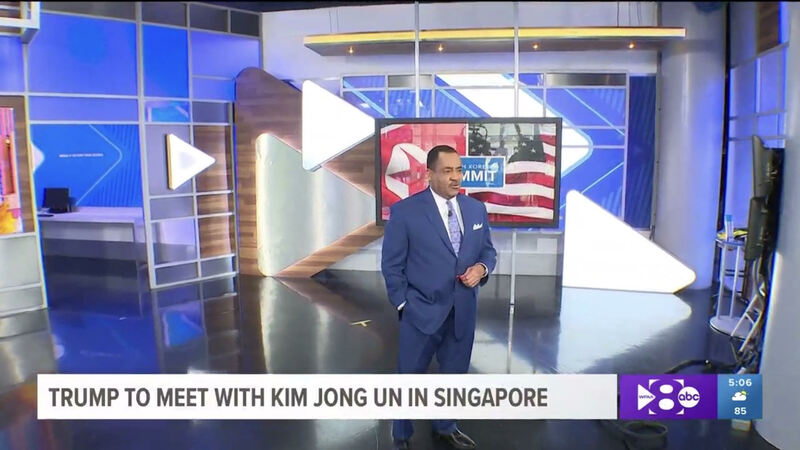 The studio, which is located in the Victory Park development that includes the American Airlines Center, home of the Dallas Mavericks and Stars professional sports team, received a significant refresh by the set’s original designer, Jack Morton Worldwide. The original Victory Park studio set incorporated the surrounding architecture in its strong grid-like design that blended printed graphics with frost and openings. 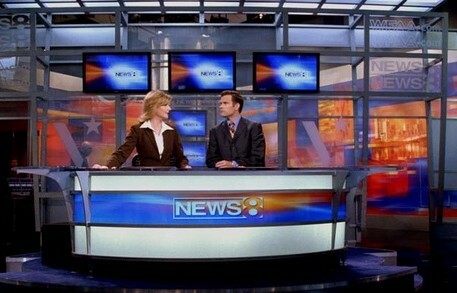 The basic structure of that grid remains, though the anchor desk has been replaced with the boomerang-shaped anchor desk used at many other Tegna stations with a seamless LED video wall behind it that replaces the array of branded graphics and frost that was originally here. Hints of the grid are also featured prominently in the wall’s header. Most of the openings behind the main anchor area have been filled in with non-branded frosted and wood panels, though two openings leading to an in-studio work around remain on either side of the video wall. This alcove’s walls also features outlines of a new design element for the station — a triangular “play” icon. Included in the station’s updated logo design, this icon features rounded corners with its point “tucked” into the left side of the “8,” which retains the station’s “reversed out” design. The element is also prominently featured in a multipurpose area to the right of the main anchor desk, where oversized versions created from wood, metallic and backlit surfaces are layered on top of each other and around a video panel. 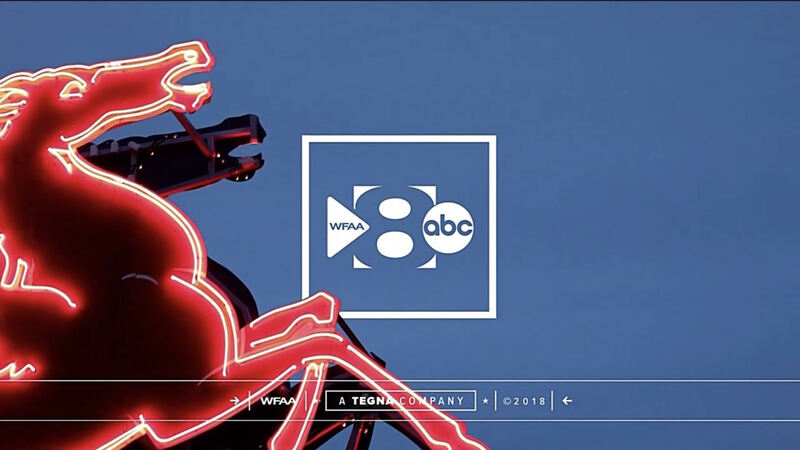 WFAA also updated to Tegan’s clean and flat graphics package, which utilizes the new logo, like with most other stations to receive the new look, in a thick box.